Buache's fantastic speculative mapping of the undiscovered Antarctic continent. Chart of the Antarctic Polar Circle, with the Countries Adjoining, According to the New Hypothesis of M. Buache. From the Memoirs of the Royal Academy at Paris. This is an unusual and highly speculative map of the southern Polar Regions (Antarctic) drawn in 1763 by the scientific geographer M. Buache. A subtle and unusual map that yields more fascinating discoveries the longer one studies it, this chart centers on the South Pole and extends northwards as far as the Tropic of Capricorn. Though predating the discovery of Antarctica by more than half a century, Buache's map details a fanciful Antarctic Pole sandwiched between the tip of Cape Horn, the Cape of Good Hope, and southern Australia, which stretches northwards off the map as far as New Guinea (to which the mainland of Australia erroneously attached) and Indonesia in the upper left. The map also features 17th & 18th century land and ice sightings in the southern seas, and name drops De L'Isle, Drake, Halley, and even Ortelius. Heading inward towards the Pole, the map shows a circle labeled ‘Land Yet Undiscovered,' and another within that, labeled ‘Frozen Sea as Supposed.' None of which stops it from depicting the best guesses as to what might exist there. Most interestingly, New Zealand is only the northernmost tip of a great southern continent. This map was published in 1763 by the Gentleman's Magazine, a famous 18th century english journal, as part of an article entitled Geographical and Physical Observations, including a Theory of the Antarctic Regions, and the frozen Sea which they are supposed to contain, according to the Hypothesis of the celebrated M. Buache. Philippe Buache trained under the great cartographer De L'Isle, married De L'Isle's daughter, and went on to become geographer to the King of France. One of the pioneering geographers of his era, Buache originated the concept of water basins, and hypothesized a great southern continent as two distinct land masses. 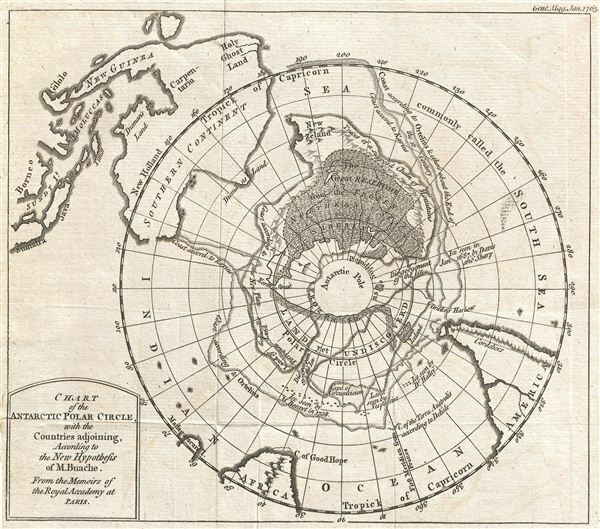 Following the best practices of his time, he compiled the first iteration of this Antarctic map in 1739, based on seafarer's sightings, and on his own theory that South Pole glaciers must originate from a great frozen sea to the south, itself fed by waters that run down from great mountains. Buache's mapping of the South Pole as two land masses is often cited by alternative history buffs as proof that he had secret knowledge of a pre-glacial Antarctica extracted from a lost civilization (Atlantis?) or possibly space aliens. In fact Antarctica is a cluster of smaller islands attached to several large landmasses which are themselves covered by a great ice sheet; however, Buache's map bears no relation to reality of the continent's sub-glacial topography. His mapping of Antarctica is rather based solely on scientific speculation – which his article explains in considerable detail. A great map for the explorer in all of us. Gentleman's Magazine, Buache, P., 'Geographical and Physical Observations, including a Theory of the Antarctic Regions, and the frozen Sea which they are supposed to contain, according to the Hypothesis of the celebrated M. Buache', (London) January, 1763. Tooley, R. V., The Mapping of Australia and Antarctica, 273. Jolly, D. C., Maps in British Periodicals, GENT-166. Marshall, D. W., Research Catalog of Maps of America to 1860 in the William L. Clements Library, University of Michigan, Ann Arbor, Michigan, I-201-1-2. Spence, Sydney A., Antarctic Miscellany: Books, Periodicals & Maps Relating to the Discovery and Exploration of Antarctica, (London) 3029b. Clancy, R., and RIchardson, A., So Came They South, p. 112-3.